In the village where I was coming from everybody had their home, their farm. We had poverty but not for food and shelter. But when I was twelve, we moved to Mumbai, I saw the slums for the first time. Women sitting on the roadside for a toilet. That shocked me. No TV in those days, so I had never even heard about a slum. I remember I spent a sleepless night, saying, "Why, why, why -- why are they so poor? I can’t understand." Something started working within me. I would repeatedly ask my friends, teachers, nuns about this, "Why is nobody doing anything for them?" And they usually responded, "How much can we do, looking at this big population?" In my early teenage years, I remember seeing Mother Teresa from a distance and it left a big impression on me -- look at how much love can do. So I started volunteering with them. For a short time, when I was 17, I had a job also. So many boys were trying to convince me for marriage. Many things like that. But my heart was taken by service. I was in Mumbai at the time, and I just felt like I needed to help. 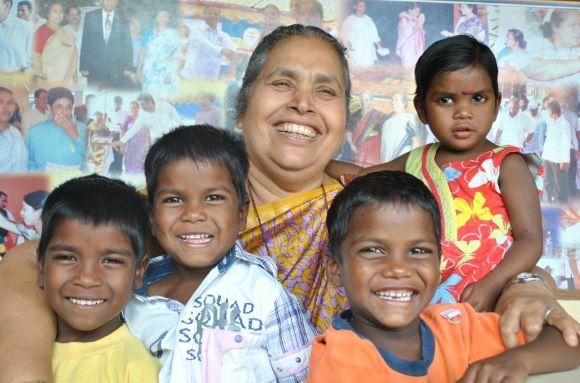 At age of 18, I went to Mother Teresa's order and filled up the form to become a nun. But they told me that it required the signature of my parents. So I visited my parents in Kerala to get their permission. Those days, it took four days for me to reach South India. When my parents asked, "Where are you going? ", they started to cry. See, those days, people believed that leprosy was contagious and since Mother Teresa was picking up leprosy patients, my parents felt it was unsafe. I was very fond of my parents, and my parents were very fond of me -- I never wanted to do anything to upset them, because they had always been so supportive. So I abandoned my plan. Then, after some time, when I was about 20, I came to know about Holy Cross Nuns. Still, I had a lot of difficulties in joining, but I was determined. I was very happy to ordain, and so many decades later, I'm still a nun in that order. How did you start Maher? After about twelve years as a nun, I felt like I wasn't really serving the poorest of the poor. That was my deepest calling, so the sisters finally allowed me to go to a village and help directly. While I was working in the village, a woman came to me asking for shelter. She told me that her husband was in love with another woman, and this man, she told me that he was an alcoholic. She said, "If I stay with him he will beat me. I need to go out of the house." I couldn't take her into the convent since she was a lay person. But how else can I help? I knew it was a genuine story because she was weeping her eyes out. Yet I had no choice but to send her back that night. It so happened that that very night she and her husband must have had some fight. He poured kerosene on her and set her on fire. This woman was seven months pregnant. I heard the shouting because our convent was very close to the slum. So I went there, like any other onlooker, to see what was happening. She came running to me: "Save me! Save me!" No one nearby had a car, so I finally got a rickshaw and took her to the hospital. The doctor told me she was already 90 percent burned and there was no way to save her. I asked the doctor if anything could be done to save the baby, but what he found was also a fully burned baby. I was holding it -- the fetus, that they had given to me. I was completely devastated. As the days went by, I became a very angry person. All this frustration was leading to anger. For no reason, I was getting upset with people living with me. My friends advised me, "Lucy, you should go for some counseling because you are becoming something you’re not." Fortunately for me, that counselor ended up being a very open-minded man, Father D'souza. He told me, "Lucy, instead of waiting for others to do something, why don't you do something?" I said to myself, "He's gone crazy. I'm a woman, with no money, no education. How am I going to help other women?" But you know, he told me one sentence that is still with me: "If you have love in your heart, you can do anything." So I found the courage in my heart to start something, to support women in the village. My superiors at the convent felt that I had lost my mind. :) "To organize something requires a lot of personnel, money, knowledge. Plus, it's a lot of trouble to look after these people." But I was not willing to listen. Back of my mind, I was thinking that if Mother Teresa can do it, so can I. Eventually, they gave me permission to leave. Over the years, we had created a nice rapport -- I was very fond of the nuns, and they were also fond of me. So they let me stay in the convent and be a part of the congregation, but the work I was doing would not belong to them. I started Maher, which means mother's lap in the Marathi language. All I had was 20 rupees of pocket money. How did it blossom from there? I feel like the divine worked with me and walked with me. I had no other plan B.
I would always write letters to Father D'souza, describing how I felt. "When I see a woman on the street, I am restless. When I stand next to a child who is begging, I am very unhappy." I would recount stories that women used to tell me. I had never heard such stories before. One of the women told me that her husband put her hand in the rice pot where she was cooking. I couldn’t imagine a man could do that. And then she added, "My children and I starved last night." I used to come to the back of the convent and always ask, "How can human beings go through this?" One day, while Father was teaching in Germany, he met someone from Austria who said, "I want to help someone helping women in India." Immediately, he thought of me. And that was my first big donation, of one lakh rupees. For me, that was a lot of money. I had never dealt with money, and anyone who knows me knows that I still can't deal with all those zeros. :) I thought I could get the world with this money, but then I went to look at land -- and nothing. Finally, in a very remote village, we were able to get a small piece of land. But then I noticed that whenever I spoke to people about Maher -- wherever I was working -- they would respond. Ordinary people from the village, even women who were suffering, they started giving me money -- 20 rupees or 50 rupees, whatever they could share. I remember how we used to get fresh vegetables donated every day at one of our homes, and it would come via the home of a rich person. One day, I went to thank the rich man, and he told me that it was actually a vegetable seller who was donating every day. He didn't have a way to get to them, so he used their car. I worked hard to find that man, just so I could thank-you. So simple, so kind, not wanting any credit. I was so touched, that I invited him as a chief guest at one of our events. Many big people were there, but here was a vegetable seller on stage. He said just one sentence, but he spoke volumes. I am grateful for the divine that worked through him. That is what has helped me. I'm just an instrument. In 1997, we were able to open our first home. Now, we have 46 homes in different parts of India. What happens in a home? Originally, I just wanted to help 20 women. But afterward, when I started talking to the women, I realize you can't help women without supporting their children. And you can't help women and children, without supporting men. So we include everyone now. Maher is home for many from the abused, neglected, physically challenged and mentally disturbed populations of society. A young child that is left by the roadside, a traumatized woman who has gone mute, children of a prostitute who has no safety, a beggar on the streets in immense physical pain, an elder who was abandoned by their loved ones. We have 984 children currently, 352 women, and many men now too. 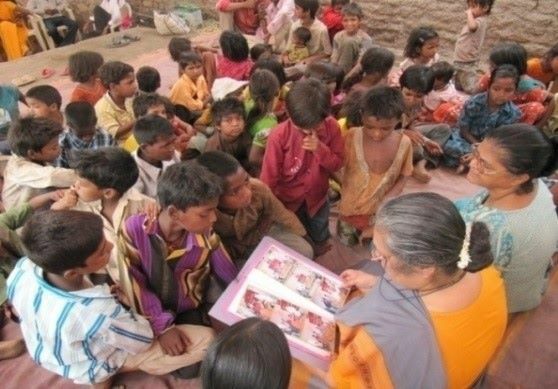 In many cities and villages, we run many other local programs. We don't have a count, but every day, we would be reaching tens of thousands of people. We nurture them physically, educate them, but also help them grow emotionally and spiritually. Women's shelter offers counseling and vocational training; children are placed in local schools, given healthy nutrition, tutoring, exposure to arts and athletic programs, and above all -- unconditional love. 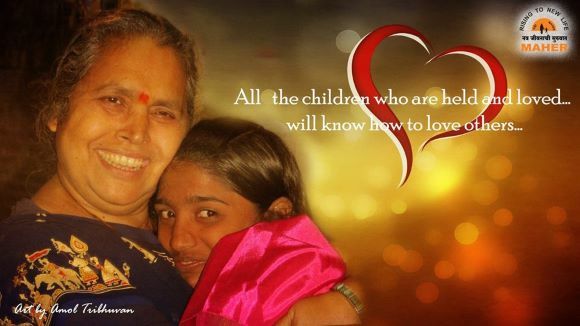 Our true purpose is to give love -- a mother's lap, when so much is going against you. My room at Maher has three beds. One is for me, and the other two are empty. The door is always open, and any of the kids can come in and sleep on the other two beds anytime. In thirty years of doing this work, we've seen so many transformations. Orphans building their own families, families being reunited, young adults finding their purpose. It's all quite profound. Can you tell us one story about a transformation? Well, let me tell you a story of a white shirt. I met a young Muslim boy, Gaus, when he was 7 years old. His father was an alcoholic and also paralyzed. He had 2 sisters and a grandmother all staying in a 10 X 10 space with a plastic tarp as the ceiling, with no electricity. 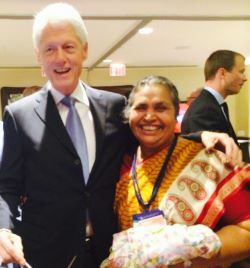 His mother worked about 18 hours a day, as a maid. To help her, from the age of 5, Gaus had two jobs! He worked in a garage cleaning cars, and at a food stall, so he can bring leftovers scraps home. When our social workers had found the child-labor situation, they asked me to visit. When I asked him if he wants to go to school, he immediately agreed. His mother also said yes. He had tried to attend a school nearby, but they couldn't keep him because government inspectors required a white-shirt uniform. That shirt would cost 300 rupees, but his mother only had 25 rupees (about 30 cents). On the way to Maher, the 7-year-old Gaus was so happy that he was jumping up and down in the car -- he had washed cars from outside, but it was his first time inside. That night, when they offered him a meal, he started eating hastily with both hands. It was the first warm meal of his life. When we gave him a blanket, he couldn't believe it was just for him. Back home, he shared one bedsheet with all siblings. When it was time to brush his teeth the next morning, he kept on brushing since he loved the sweetness of the toothpaste! Oh, and we gave him a white shirt. We joke now that he kept it on till it became black, but in reality, he felt that if he took it out, he feared it would get stolen and he would never get another chance to go to school. That same Gaus has now graduated from college, completed his MBA and even traveled globally. 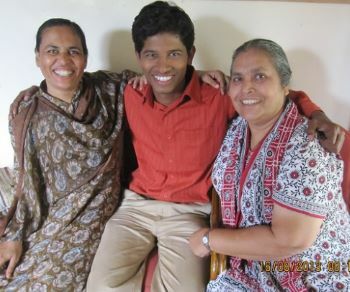 He just got his first job in Hyderabad, and every weekend, he trains to Pune to be with younger kids at Maher. You mentioned that you have 984 kids (outside of me and women). It was 980 few days ago. There's so much need in the world, but you can't possibly help everyone. Right? Whenever God shows me a need, I serve. My formula is simple -- for every thirst, God provides water. That much faith I have. :) If a need is shown to me, another door of resources will be opened elsewhere. I never worry about whether I can support a child, or how big or small the need is. That's not my job. I'm just an instrument. It's very hard for people to understand love. When I go to a new village, they wonder about my motivations. Am I here to make money? Fortunately, they all get that I'm not trying to make money. But why else would I serve? Must be to convert them! But I'm not here to convert anybody. In that sense, I'm different from Mother Teresa. Still, people wonder: why? It's so hard for people to believe in love with no other agenda. 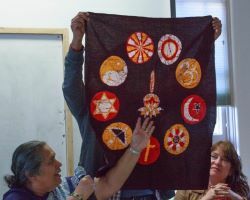 When I started Maher, I felt that providing shelter was fine -- but what kind of spirituality can we offer? I only knew about Catholic faith, because that's what I grew up with, but my home was for all who needed it. We had children of all kinds of faiths. Hindus, Buddhists, Muslim, Christians, everybody. So I was thinking one night, and this idea came to me -- of a banner with religious symbols of all the major faiths. Every Maher home has this banner. On our altar, we have various holy books -- Koran, Bible, Bhagavad Gita. We don't take the name of a particular God. We use the word "Divine". Even personally, I only wear an all-religions necklace on my neck. Every day, I meditate. 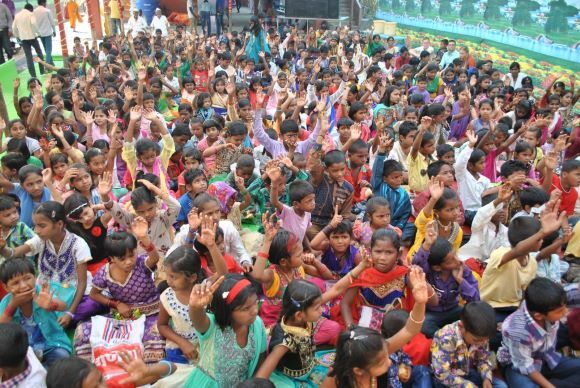 During Christmas, if you ask our kids how many are Christian, they will all raise their hands. At Diwali, how many are Hindus? All hands. At Eid, how many are Muslims? All hands. We celebrate all faiths. Still, people make all these assumptions. My name is very Christian, so perhaps that's why. I remember one time, a local group had come to finish me off. They didn't know anything about our work, had never been inside, but they heard all these rumors. Fortunately, I wasn't at the home at that particular moment, so our kids welcomed them in. It so happened that it was around 7:30PM, so it was prayer time. They closed their eyes, like little kids do, and said their universal prayers. Our visitors could see different holy books on the altar, and all-religions symbol. At the end of all prayers, kids say something spontaneous that comes in their heart. So, that day also, one little one says out loud, "I pray that all of our visiting Uncles find peace in their hearts and joy in their families." Things like that. That kid didn't know anything about the situation, but still, that's what he said. Then, these visitors asked the kids, "Okay, how many of you are Christians?" All hands. "How many are Hindus?" All hands. Muslims? All hands. These people became quite confused and didn't know what to do. After prayers, the kids welcomed the "Uncles" with tea. We don't have anything fancy in our homes, so just chai (tea). There were a lot of Uncles, and we didn't even have enough cups, but the kids sweetly offered it to them as best they knew. Then, when I walked in, we spoke in the few words I knew of the local dialect. They were very stern and even I couldn't understand why they were like that. One by one, though, they left the place and the kids noticed that as they were leaving, they were picking up all these weapons they had brought with them. One fellow was particularly drunk. And see, when we are drunk, we sometimes tell the truth. :) He started to speak to me before he left, and said that they had come to finish me off and break down the house. But the kids had melted their hearts. Sometimes even dealing with the kids themselves would prove to be a challenge? All the time. You see, the kids test you. Most of these kids are from the streets, and sometimes just listening to their language can hurt your ears. It's very hard, what our staff has to do everyday. It takes a very big heart. Just a few days before I came on this trip, a young man came to visit us at Maher. He had earned his first salary at a job and came to personally gift it to us. Then he shared his story with the others. Many years ago, he was on the streets -- and was taken into various homes, but everywhere, he was thrown out. No one knew how to handle him, let alone discipline him. Then, someone said, "Send him to Sister Lucy." He came, and he troubled us a lot too. All staff had given him way too many chances and were on the edge of kicking him out. One day, when he was in 11th grade, he came home a bit hungry. He opened the fridge and saw a cake. Now, the cake was for all the kids, for a birthday, but without thinking, this young man ate half the cake. The cook was furious, and they exchanged some heated words. I don't know what all happened, but this kid just slapped the cook -- someone at least twenty years older than him! That was it. All seven staff of that home got furious and came to me and said, "If you don't kick him out, we'll all quit." After many conversations, I calmed the staff a bit. Then, I met the boy. Because he was seeing me, he thought that he was most certainly going to be kicked out as a disciplinary action. But the first thing I did was hug him. And then I told him, "I love you." I never quit on a child. Now, this was a very very tough kid, but he started crying for the first time. "Do you think what you did was right?" "No." "Have you apologized?" "Yes, but they didn't accept my apology." And so on, it went. We were able to work things out, and he grew up with us. Now, many years later, he came back to Maher with his first salary. Just this month. He told his story and ended by saying, "That day, had I not got that hug and felt that love, I had made up my mind to join a terrorist group. I was going to get a gun and come back to shoot all the staff. But Sister Lucy told me she loved me, tears rolled down my eyes, and my life took a different turn. Whatever you do, don't forget about the power of love." That was just a few days ago. Stories like that really show you that love is the most powerful force in the world. It may not work 100% of the time, but after all these decades of experiences, I can say that it will definitely work 99.9% of the time. You recently met the Pope?! Yes, I felt so privileged to meet the Pope. Pope Francis. When I met him, of course, I first asked him, "Father, please pray for me that I can serve more." He said, "No, Sister, please pray for me." I felt so humbled at that moment that I didn't know what to say. So I asked him again, and he repeated the same. And in our short few minutes together, he asked me three times. More than me, it shows the power of his humility and grace. Thank you, Sister Lucy, for all that you are. Thank you, to all of you at ServiceSpace. I have come here to Northern California to learn compassion from my teachers here. I feel that the divine energy flows through your work, and I'm deeply grateful for our connection. Some of would be knowing that, last year, I saw a woman on the streets who was completely naked and out of her mind. She had endured tremendous abuse, and as a result, she was mute (and hasn't spoken a word till date). I put a shawl on her and asked her to come with me. Usually, they might throw stones at you and resist, but surprisingly, this woman immediately came to me. It turned out that the woman was also pregnant and delivered a baby girl. While she was unable to mother the child, we adopted her. 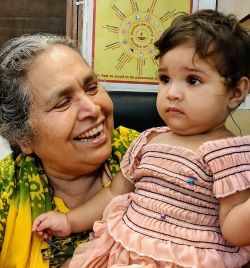 We named her Swara, after a ServiceSpace volunteer, with the hope that she will grow into those values and bring that energy into Maher and the world. On paper, your story is against all odds. 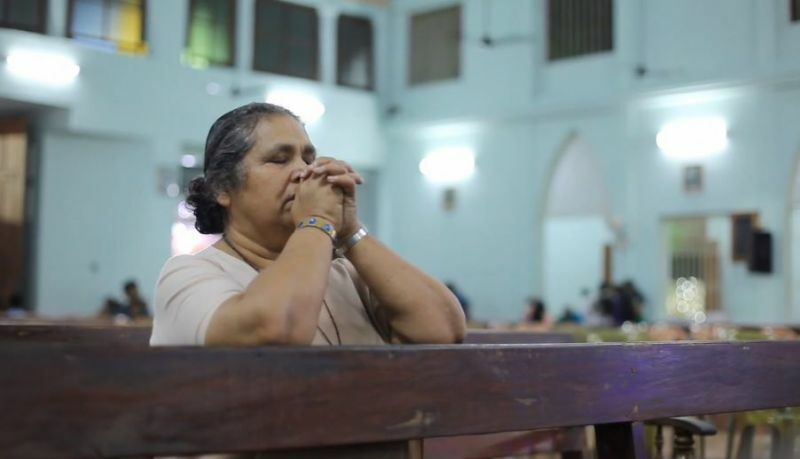 You were a woman in a patriarchal context, Christian in a largely Hindu country, a nun with no money in an increasingly commercial world, a leader with just 7th-grade education. What is your source of strength? Surrender. Every day, I see some of the most inhumane acts. Almost every hour, I have to make very difficult decisions. Sometimes I wish I could just be a simple nun again. Everyone asks their higher-ups for greater wisdom, but I have no one over me. Who do I go to? Especially, earlier in the village, with no communication channels, sitting in a village, faced with a very complicated situation, what do I do? I have no choice but to fall on my knees, pray and surrender. Every morning, I wake up and pray, "May Divine Energy enter me, and may it flow through each of my actions. May you walk with me every moment." That surrender is the source of my strength. Divine always responds. I can feel it. We can all feel it, but it's just that we're too busy with other plans. As we come to trust it, skilfulness works through our hands, head and heart. At one of our homes, the government officials were asking for a bribe. I never give a single rupee for a bribe. For three years, we had no electricity. Then one fine day, the officials came for a visit. After seeing everything, they ask for bribe again. I spontaneously took him in front of a random row of half a dozen kids, and told him their stories. And then I asked, "For the amount of bribe I would give to you, I would have to put two of these kids on the streets. Can you tell me which two kids you would choose?" We soon had electricity. People often ask me, "How can we change this system?" I don't think we can. So long as our minds are filled with tensions, how can we expect our world to be free of suffering? AndI don't think this is a problem to be solved. It is actually an infinite opportunity for practicing compassion, for helping others cross the shore. What a great joy that is! At Maher, one of our mottos is -- "There's Always Room for One More." We can always expand our hearts. Compassion is infinite. I love you Sister Lucy and the whole Maher-Family. I am very grateful for having Lucy didi in my life.You are really great soul with kind & lovely heart. Love you didi. This is so valuable. Thank you for sharing. amazing story, good to see happy faces in the photo!